The Hang Ten Rug Collection brings a refreshing casual beach vibe and a new design twist to our Caron's Beach House area rug offerings. With Hang Ten’s philosophy being “fun in the sun,” we are thrilled to be jumping on board with such an established and well-recognized surfing lifestyle brand. Come see all three distinctive collections, all beautiful, all casual and with a touch of surfer chic! 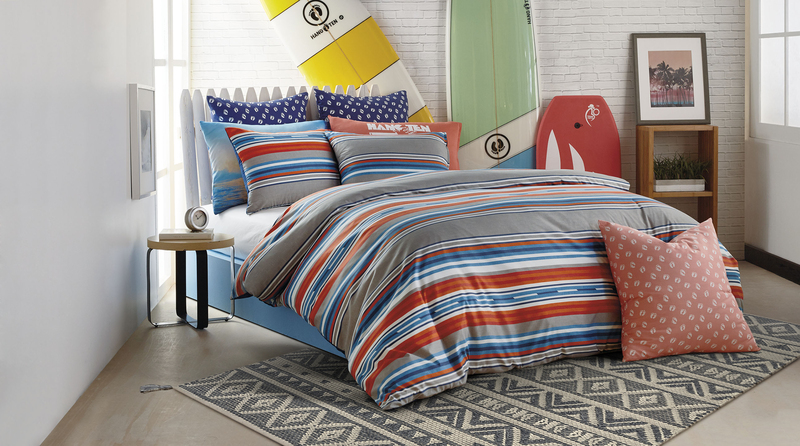 Invite easy, breezy sophistication into any room with our Hang Ten Malibu Collection. Handwoven of 100% Polyester in India, the plush and chunky weave of these rugs will invite your guests to lounge after some fun in the sun. Great colors and designs abound in this collection and the decorative tassels on the rug corners add depth and dimension to your living space while keeping it fun and flirty! Simple yet stylish, our Hang Ten Palm Beach Collection offers hand-woven jute rugs with polished fringe finishing in chunky solids and chic coastal styled stripes. These 100% all natural jute rugs bring a refined neutral element into any space! These rugs are handwoven in India and have a very low pile height of 1/4". Our Hang Ten Sunset Beach collection represents that natural boho, free spirited look and feel we all yearn for. Made in India, these ultra soft, colorful hand-woven natural jute and Sari silk flat woven rugs add a neutral element to any room and are lightweight enough to roll up and take to the beach! Sunset Beach rugs have a very low 1/8" pile height making them perfect for everyday casual seaside living!